According to Tass, both leaders will discuss “views on how, at what pace and in what sequence” to restore normalized bilateral relations – ruptured after Turkey downed a Russian warplane in Syrian airspace last November. Both leaders will “exchange views on regional problems” – notably Syria. At stake for Turkey is restoration of trade. Billions of dollars were lost after Russia imposed sanctions in response to Ankara’s hostile act. “This will be a historic visit, a new beginning,” Erdogan claimed. Throughout the conflict, Turkey partnered with Obama’s war, serving as a safe haven and launching pad for ISIS and other terrorist fighters to cross freely into Syria, providing them with arms and munitions, profiting from selling stolen Syrian and Iraqi oil. 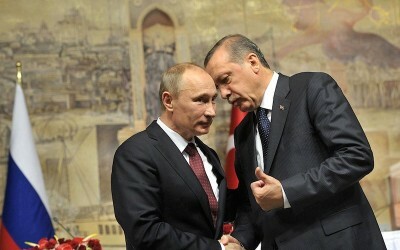 In return for normalizing ties, Putin demands Erdogan to reverse his current policies. He wants his support for terrorist fighters ravaging Syria ended. He’s capitalizing on strained relations between Ankara and Washington over the disruptive July 15 events, Erdogan’s coup d’etat power grab blamed on cleric Fethullah Gulen living in America, a longtime CIA asset, Turkey suggesting possible US involvement in what happened. Russia’s intervention in Syria last September at the behest of its government changed things dramatically on the ground. At the same time, Turkey’s support for terrorist fighters indispensably aids Washington’s regional imperial agenda. Iraq, Jordan, Lebanon, Israel from occupied Golan, and Turkey border Syria – Turkish territory bordering its entire northern area, a key launching pad for conflict. Eliminating it would be a major step toward resolution. An opening exists. Putin seeks to capitalize on it despite knowing the risk of dealing with an international outlaw at war with his own people, systematically eliminating opponents, consolidating hardline rule – his promises meaningless unless proved otherwise. In the interest of hoped for restoration of regional peace and stability, it’s a gamble well worth taking.